I wonder if there is a support for C++ in Netbeans 9. This link shows C++ on screenshot (when creating new project). However, after installing, I don't have one. I wonder if there is a support for C++ in NetBeans 9. No, in the sense that the use of C++ on NetBeans 9 is not currently supported by Apache, and it is done at your own risk. NetBeans is currently being handed over from Oracle to Apache, and they haven't got to the C/C++ part yet. See What's Happened to My Favorite NetBeans Plugins? for more information. Yes, in the sense that it is technically feasible to do it; the NetBeans 9 IDE allows you to use C/C++. Step 1 of 2: Make C/C++ available as a plugin. Tools > Plugins > Settings tab > click the Add button. This should create a new entry in the Configuration of Update Centers list in the Settings tab. Checking that new entry should instantly add plugins to the Available Plugins tab. Click the Available Plugins tab, then click the Category column to sort the entries by category. Step 2 of 2: Install the C/C++ plugin. Check the C/C++ entry shown in the screen shot above, and then click the Install button. Follow the wizard's instructions. The plugin will be downloaded and installed, and you will be required to restart NetBeans. 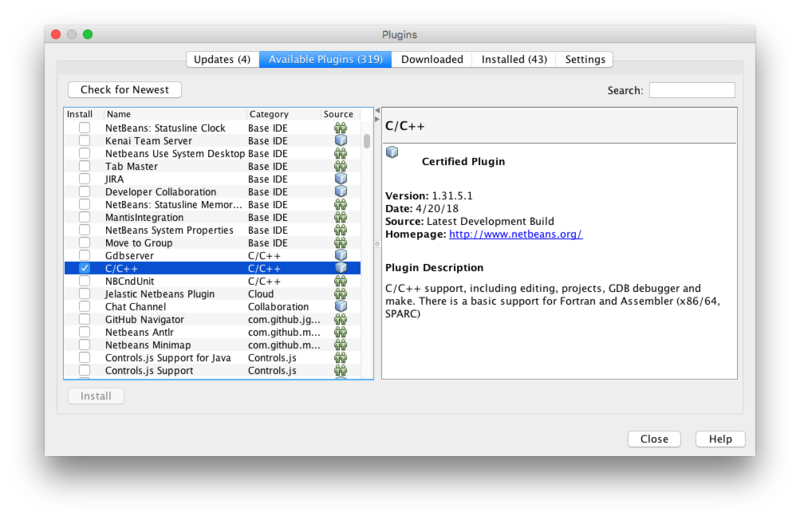 To confirm that C/C++ has been installed, click Tools > Plugins > **Installed tab. You should see an entry for the C/C++ plugin you just installed. 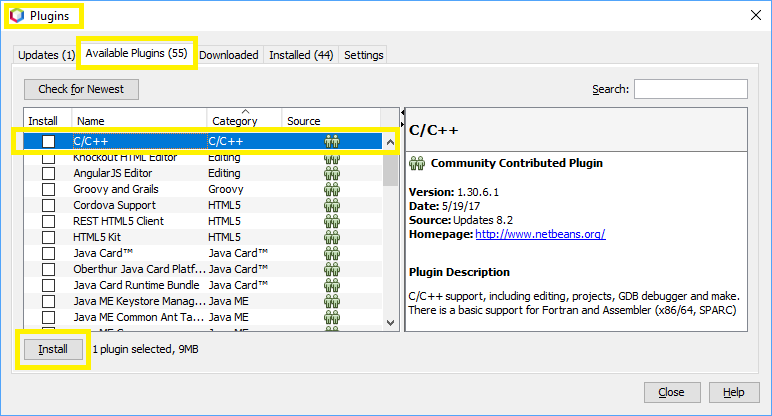 The finer details on configuring C/C++ on NetBeans 9 (Tools > Options > C/C++) are unchanged from NetBeans 8.x. Refer to Configuring NetBeans IDE 8.0 for C/C++/Fortran for that. Much of this answer has been copied from an answer I gave on problems with Tomcat on NetBeans 9, but the details are sufficiently different to merit a separate answer. 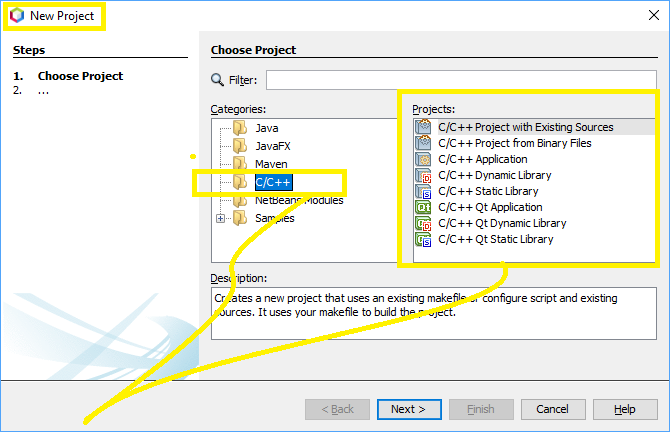 Netbeans 10 - adding C / C++ also works in the same fashion. Entry NetBeans 8.2 Plugin Portal is already present. Click the checkbox next to this entry. Switch to Available Plugins tab, click Check for Newest. C / C++ is now on the list. Computer that this is done is on Windows 10 x64. Not the answer you're looking for? Browse other questions tagged c++ netbeans netbeans-9 or ask your own question. How to make NetBeans IDE 9 work with PHP?